24 Hours of Radio/ART (Volume 4) will feature one full day of radio programming. 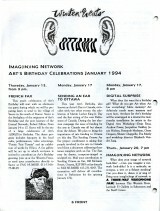 Hosted at the Western Front during the annual Art’s Birthday celebration, the show will run from 12am on the morning of January 17, 1996 until midnight the following morning. This program will be part of a larger celebration of Art’s Birthday which traditionally is a day devoted to international exchanges using telephone connections for audio, video-phone, slow scan, fax, e-mail, and in recent years of Internet exchanges. The radio program will feature a variety of audio works which use telecommunications technology to explore ideas relevant to electronic networking, and the theme of the Birthday celebration. This programming will include: live phone-in shows, Internet chat line exchanges, Internet audio-files, taped pieces, and live performance pieces. The day will close with the Radio Arcade: a 6 hour public event featuring the work of 11 artists – Hank Bull, Don Chow, Peter Courtemanche, Colin Griffiths, Kathy Kennedy, Robert Kozinuk, Bill Mullan, Judy Radul, Adam Sloan, Zainub Verjee, and Lori Weidenhammer. The concert will be informal – an exhibition of performances, short radio works, exchanges with other Art’s Birthday sites, and behind the scene dynamics. The atmosphere will be relaxed. Drop by in the evening between 6 pm and midnight, and plug your quarters into the machine.